Well done to 9 of our children who participated in the Forest of Dean Panathlon at Hartpury College. In total 10 schools took place, with our team coming 5th overall. The children all tried their very best and took part with fairness and enthusiasm. 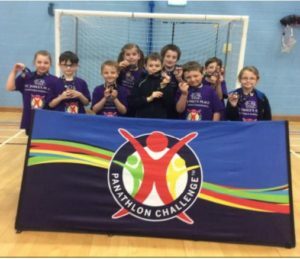 At the beginning, one or two were very nervous as this was their first time in a sporting competition, but as the competition got underway they became more relaxed and were soon enjoying the whole experience, as did other children. Many thanks to the staff and parents who helped with transport.